Alzheimer's disease (AD) is a devastating neurodegenerative disorder and a major medical problem. Here, we have investigated the impact of amyloid-β (Aβ) oligomers, AD-related neurotoxins, in the brains of rats and adult nonhuman primates (cynomolgus macaques). Soluble Aβ oligomers are known to accumulate in the brains of AD patients and correlate with disease-associated cognitive dysfunction. When injected into the lateral ventricle of rats and macaques, Aβ oligomers diffused into the brain and accumulated in several regions associated with memory and cognitive functions. Cardinal features of AD pathology, including synapse loss, tau hyperphosphorylation, astrocyte and microglial activation, were observed in regions of the macaque brain where Aβ oligomers were abundantly detected. Most importantly, oligomer injections induced AD-type neurofibrillary tangle formation in the macaque brain. These outcomes were specifically associated with Aβ oligomers, as fibrillar amyloid deposits were not detected in oligomer-injected brains. Human and macaque brains share significant similarities in terms of overall architecture and functional networks. Thus, generation of a macaque model of AD that links Aβ oligomers to tau and synaptic pathology has the potential to greatly advance our understanding of mechanisms centrally implicated in AD pathogenesis. Furthermore, development of disease-modifying therapeutics for AD has been hampered by the difficulty in translating therapies that work in rodents to humans. This new approach may be a highly relevant nonhuman primate model for testing therapeutic interventions for AD. Alzheimer's disease (AD) is histopathologically characterized by the presence of extracellular fibrillar amyloid-β (Aβ) deposited in plaques and intraneuronal neurofibrillary tangles (NFTs) consisting of aggregated hyperphosphorylated tau (phospho-tau) (Querfurth and LaFerla, 2010). Knowledge on mechanisms of AD pathogenesis and on preclinical evaluation of treatments directed at Aβ or phospho-tau have come from pathology, genetics, and various transgenic rodent AD models (Braak and Braak, 1991; LaFerla and Oddo, 2005; Goedert and Spillantini, 2006; Yoshiyama et al., 2007). Due to the complexity of the neuropathology spectrum of AD, such transgenic models are very useful for studying some, but not all, disease aspects. In particular, NFTs are generally not present in transgenic models expressing mutant forms of human Aβ precursor protein (APP) and/or presenilins. A significant advance in the field came from development of transgenic rodent models that presents tau pathology (Oddo et al., 2003a,b; McGowan, et al., 2006; Chabrier et al., 2012; Cohen et al., 2013). Most of these models harbor not only mutations in APP and/or presenillin1 but also a mutation in tau. The latter is associated with other tauopathies, such as frontotemporal dementia (Spillantini et al., 1998; Götz and Ittner, 2008), but is not part of AD pathology. In addition, the most frequently used transgenic AD mouse models carry mutations that are associated with early onset familial forms of human AD, which only account for <5% of cases. The vast majority of AD cases are sporadic with poorly understood etiology. The pathogenic trigger of AD has been proposed to comprise soluble Aβ oligomers (AβOs). AβΟs, synaptotoxins that accumulate in AD brains, have been implicated in key aspects of AD (DaRocha-Souto et al., 2011; Ferreira and Klein, 2011; Selkoe, 2011; Chabrier et al., 2012; Finch and Austad, 2012). In cell-based systems and animal models, AβΟs are associated with AD hallmarks, including phospho-tau, oxidative stress, and synapse loss (De Felice et al., 2007, 2008; Jin et al., 2011). Of clinical relevance, individuals who died without signs of cognitive and intellectual deterioration presented abundant brain amyloid deposits, whereas conversely, individuals lacking deposits exhibited varying degrees of cognitive deterioration (Negash et al., 2011). Given the proposed roles of soluble Aβ in AD and the limitations of currently available animal models (Mucke and Selkoe, 2012), we here investigated whether intracerebroventricular (i.c.v.) injections of AβΟs in the brains of adult cynomolgus macaques might induce AD-like pathology. Macaques are old-world nonhuman primates typically used as models of human sensory, cognitive, and motor processing due to considerable similarity of higher brain structures (Orban et al., 2004; Sereno and Tootell, 2005; Kaas, 2013; Van Essen, 2013). We first developed the experimental approach in rats before moving to the complexity of the macaque system. Results demonstrate that AβΟs rapidly diffused and were detected in neurons in a regionally specific manner in rats and macaques. Whereas AβΟs were abundantly detected in the neocortex, hippocampus, striatum, and amygdala, regions such as the brainstem and cerebellum presented markedly fewer AβΟ-positive neurons. In the macaque brain, AβΟs induce astrocyte and microglial activation, synapse loss, phospho-tau and NFTs formation, in regions associated with cognitive functions and operant behavior. Collectively, the results provide evidence on the impact of AβΟs in the primate brain and establish a novel macaque model that presents central AD neuropathological correlates. AβΟs were prepared from synthetic Aβ1–42 peptide (American Peptide) as described previously (Lambert et al., 1998). The peptide was first solubilized in hexafluoroisopropanol, and the solvent was evaporated to produce dried films, which were subsequently dissolved in sterile anhydrous dimethylsulfoxide (DMSO) to make a 5 mm solution. This solution was diluted to 100 μm in ice-cold PBS and incubated for 16 h at 4°C. The preparation was centrifuged at 14,000 × g for 10 min at 4°C to remove insoluble aggregates (protofibrils and fibrils), and the supernatants containing soluble AβOs were stored at 4°C. Protein concentration was determined using the Bicinchoninic acid assay (BCA; Thermo Scientific Pierce). Preparations were routinely characterized by HPLC size-exclusion chromatography under nondenaturing conditions and by SDS-PAGE/Western blot using anti-Aβ 6E10 (Covance) and anti-AβO NU4 (Lambert et al., 2007) antibodies. Size exclusion chromatography (SEC) analysis reveals that Aβ oligomers preparations comprise a mixture of high-molecular-weight (molecular masses ranging from 80 to 150 kDa) and low-molecular-weight (average molecular mass, 10 kDa) oligomers, and are virtually devoid of Aβ monomers. Lack of monomers in AβO preparations detected SEC is consistent with the high tendency of Aβ1–42 to self-aggregate in aqueous medium, and also with previously reported SEC profiles of oligomers prepared using the same protocol we used. A complete description of the biophysical/biochemical characterization of the preparation of AβOs we used in the current work was described in previous work from our group (Chromy et al., 2003; De Felice et al., 2007, 2008; Sebollela et al., 2012; Figueiredo et al., 2013). Oligomers were prepared and immediately used in the procedures described below. Intracerebroventricular injection of AβOs. Rats. Twenty-eight male Wistar rats (Rattus norvegicus) aged 3 months (body weights: 300–400 g) were used. All procedures were approved by the Federal University of Rio de Janeiro Animal Care Committee (protocol numbers IBqM 041 and IBqM 019) and were in full compliance with the National Institute of Health Guide for Care and Use of Laboratory Animals. Rats were anesthetized with intramuscular valium (1.5 mg/kg), xylazine (5 mg/kg), ketamine (100 mg/kg), and atropine (0.2 mg/kg). Analgesia was maintained by intramuscular ketamine ad libitum. Rats were placed in a stereotaxic apparatus (Horsley-Clarke) and two craniotomies (diameter: 1.2 mm) were performed before insertion of two cannulas (Plastics One) at following coordinates: Anterior cannula (bregma: −0.92 mm; laterality: 1.5 mm; depth: 3.5 mm); posterior cannula (bregma: −4.00 mm; laterality: 1.5 mm; depth: 3.5 mm; Paxinos and Watson, 1997). After a recovery period of 7 d, rats received intracerebroventricular injections of 1 μg AβOs (n = 13) or vehicle (2% DMSO in PBS; control group, n = 15) in the anterior cannula. Injections were performed three times a week for 5 weeks (Fig. 1A). Rats were transcardially perfused with saline solution 0.9%, followed by 4% paraformaldehyde. Brains were removed and coronal 40-μm-thick sections were obtained. Seven females cynomolgus macaques (Maccaca fascicularis, body weights: 4.7–7.0 kg) were used. Macaques were maintained at the Centre for Neuroscience at Queen's University (Kingston, Canada) under the close supervision of a lab animal technician and the Institute veterinarian. All procedures were approved by the Queen's University Animal Care Committee and were in full compliance with the Canada Council on Animal Care (Animal Care Protocol Original Munoz, 2011-039-Or). All animals (3 sham animals, 4 AβO animals) underwent a single surgical procedure to anchor a dental acrylic explant to the skull with Teflon or titanium screws. The explant included a chamber over a small midline craniotomy to access the lateral ventricles. Anesthesia was induced by ketamine (10–15 mg/kg, intramuscular) and diazepam (0.25–0.5 mg/kg, intramuscular). Animals were given glycopyrrolate (0.013 mg/kg) and were intubated. During surgery, anesthesia was maintained with isoflurane (1–3%), while meloxicam (0.2 mg/kg) and cefazolin (22 mg/kg) were also administered. Correct placement of the chamber was assessed by MRI. Three sham-operated macaques, 9- (n = 1) and 16-years-old (n = 2), were used as controls and underwent the full surgical procedure but did not receive intracerebroventricular injection. After a recovery period of 2–4 weeks, four macaques, 9- (n = 2) and 16-years-old (n = 2), had a guide cannula inserted into the lateral ventricle and held in place with a grid system in the chamber (Crist et al., 1988). They then received intracerebroventricular injections of 10–100 μg of AβOs (∼1 injection per day every 3 d for up to 24 d; Fig. 2A). Even though the experimental design involved injection of a fixed amount of 100 μg of AβOs per injection in all macaques, it is important to note that in practice this amount was somewhat variable among animals due to procedural limitations at the moment of injection (including partial clogging of the cannulas and liquid reflux through the cannula following injection). Detailed information on the amount of AβOs effectively injected is present in Figure 2B. Approximately 1 week after completion of the experimental protocol, macaques were sedated with intramuscular ketamine (10 mg/kg), followed by intravenous sodium pentobarbital (25 mg/kg) and heparin. They were then perfused intracardially with PBS followed by 4% paraformaldehyde in PBS. Brains were removed and coronal 40-μm-thick sections were obtained. Immunohistochemistry was performed using free-floating sections in PBS containing 1% Triton incubated with 0.1 m citrate buffer, pH 6, at 60°C for 5 min. For detection of Tau phosphorylated epitopes (tau-pSer396, MC-1, AT100, CP13, AT8, PHF-1, and Alz-50), sections were treated with 70% formic acid for 7 min. For AT8, CP13, MC-1 (data not shown), and Alz-50 the following steps were the same for immunofluorescence. Endogenous peroxidase was inactivated by incubation of sections with 3% hydrogen peroxide in methanol for 2 h. Sections were then blocked with 5% bovine serum albumin (BSA) and 5% normal goat serum in 1% Triton X-100 for 3 h at room temperature. Primary antibodies were diluted in blocking solution and incubated with sections at 4°C for 16 h, followed by incubation with biotinylated secondary antibody for 2 h at room temperature, and then processed using the Vectastain Elite ABC reagent (Vector Laboratories) according to the manufacturer's instructions. The sections were washed in PBS and developed using 3, 3′-diaminobenzidine (DAB; Sigma-Aldrich) in chromogen solution, and counterstained with Harris's hematoxylin (Merck). Slides were mounted with Entellan (Merck) and imaged on a Zeiss Axio Observer Z1 microscope. Omission of primary antibody was routinely used to certify absence of nonspecific labeling (data not shown). For immunofluorescence analysis, tissue autofluorescence was quenched by incubation with 0.06% potassium permanganate for 10 min at room temperature. Sections were blocked in 5% BSA and 5% normal goat serum in 1% Triton X-100 for 3 h at room temperature. Primary antibodies were diluted in blocking solution and sections were incubated at 4°C for 16 h, followed by incubation with AlexaFluor 555, AlexaFluor 594, and AlexaFluor 488-conjugated secondary antibodies (1:1500) for 2 h at room temperature. Nuclei were stained with 4′,6-diamidino-2-phenylindole (DAPI; Calbiochem) for 5 min. Slides were mounted with Prolong Gold Antifade with DAPI (Invitrogen) and imaged on a Zeiss Axio Observer Z1 microscope equipped with an Apotome module to minimize out-of-focus light. Z-stack projections from the frontal cortex of macaques (total area: 7 μm, for each image: x = 0,06 μ/pixel, y = 0,06 μ/pixel, z = 0,28 μ/pixel). For synaptic puncta analyses, cells were observed with a Leica confocal microscope. Antibodies used for immunohistochemistry were Tau-pSer396 (1:200; recognizes phosphorylation of Tau at serine residue 396, Santa Cruz Biotechnology, catalog #sc-101815 RRID:AB_1129987); AT100 (1:70; recognizes phosphorylation of Tau at serine residue 212 and threonine residue 214, Thermo Scientific Pierce Protein Research Products, catalog #MN1060 RRID:AB_223652); AT8 (1:200;Thermo Scientific Pierce Antibodies Cat# MN1020 RRID:AB_223647). MC-1 (1:200, recognizes early conformational changes in tangle formation), CP13 (1:200; recognizes phosphorylation of Tau at serine residue 202); PHF- 1 (1:200; recognizes phosphorylation of Tau at serine residues 396 and 404), and Alz-50 (1:200; conformational antibody) were generous gifted by Dr Peter Davies (Albert Einstein College of Medicine, Bronx, NY). Synaptophysin (1:200, Sigma-Aldrich, catalog #S5768, RRID: AB_477523), PSD-95 (1:200, Abcam, catalog #ab18258, RRID:AB 444362); 4G8 (1:200, Covance, catalog #SIG-39220-200 RRID:AB_10174824), glial fibrillary acidic protein (GFAP, 1:500, Dako, catalog #Z0334 RRID:AB_10013382), and IBA-1 (1:200, Abcam, catalog #ab5076, RRID:AB_2224402). AβO-selective NU4 mouse monoclonal antibody was gifted by Dr William Klein (Northwestern University, Evanston, IL). For Western Blotting the antibodies used were Tau-pSer396 (1:100; Santa Cruz Biotechnology, catalog #sc-101815 RRID: AB_1129987). Total tau (Tau-5, 1:100, Abcam, catalog #ab3931, RRID:AB_304171), 6E10 (1:1000, Covance, catalog #SIG-39300-200 RRID:AB_10175290), and b-actin (1:1000, Abcam, catalog #ab6276 RRID:AB_2223210). The secondary antibodies for immunohistochemistry were AlexaFluor 488 (Life Technologies, catalog #A11034 RRID:AB_10562715), AlexaFluor 594 (Invitrogen, catalog #A21424 RRID:AB_141780), and AlexaFluor 555 (Invitrogen, catalog #A21424 RRID:AB_141780). For Western blotting the antibodies were as follows: goat anti-mouse IRDye800 (LI-COR Biosciences, catalog #827-08364, RRID:AB_10793856) or goat anti-rabbit IRDye 800 IgG (LI-COR Biosciences, catalog #827-08365, RRID:AB_10796098). The cytoarchitecture of macaques (Martin and Bowden, 1996) and rat (Paxinos and Watson, 1997) brain slices was analyzed by Nissl staining and coronal slice reconstructions were performed using the Virtual Tissue 2D module from Neurolucida (MBF Bioscience; Fig. 3A). For macaque's brain sections, tissue autofluorescence was quenched by incubation with 0.06% potassium permanganate for 10 min at room temperature. Macaque and rodent sections were incubated in 1% thioflavin S (Sigma-Aldrich) for 35 min. Some sections were stained with DAPI to visualize the cell nucleus. Slides were mounted with Entellan and imaged on a Zeiss Axio Observer Z1 microscope. APPSwe,PS1ΔE9 mice on a C57BL/6 background (APP/PS1, 13- to 16-month-old) were obtained from The Jackson Laboratory and used as positive controls for presence of Aβ deposits. For AβΟs immunostaining in rats and macaques, 20–30 images were acquired from each region of interest for each animal, with the same acquisition parameters. The percentage of AβO reactivity was assessed by manual quantification of DAPI and NU-4-positive cells present in each region of interest. For neuropathology of macaque brains, tau-pSer396, AT100, GFAP, synaptophysin, and PSD95 immunoreactivity densities were determined using a multithreshold plug-in within NIH ImageJ (Figueiredo et al., 2013). Immunostaining was performed in parallel in slides from all animals and the same acquisition parameters were used when slides were analyzed. Cells positive for CP13 and IBA-1 were manually counted according the immunoreactivity in 20–30 images from each region-of-interest for each animal, acquired with the same parameters. For synaptic puncta analyses, a total of 15–20 images per experimental condition were acquired. PSD-95 (red) and synaptophysin (green) immunofluorescence was analyzed and quantified using the Puncta Analyzer plugin in NIH ImageJ as previously described (Christopherson et al., 2005). Analyses were performed in blinded fashion. For synapses ultrastructural analysis, tissue samples from the prefrontal cortex of macaque's brains were fixed (paraformaldehyde 4%) and postfixed by immersion in 1% osmium tetroxide in cacodylate buffer with 0.8% potassium ferrocyanide for 3 h at room temperature. The samples were washed three times with 0.1 m phosphate buffer, pH7.4, and dehydrated with a graded acetone series. Uranyl acetate (1%) was added to the 70% ethanol (35 min immersion) to improve contrast in the electron microscope. The sections were then embedded in POLYBED 812 resin (EMS) and polymerized for 48 h at 60°C. The ultrathin sections were cut with a RMC ultramicrotome, collected on copper grids and stained with uranyl acetate and lead citrate and observed in a JEOL transmission EM (JEOL 1011). Images were taken at 30,000× magnification. A total of fifty images were acquired per animal/experimental condition (n = 3 sham-operated macaques; n = 4 AβO-injected macaques). Synaptic profiles were identified by the presence of the postsynaptic density and presynaptic vesicles. Electron microscopy analysis was performed in blinded fashion. Briefly, images were acquired randomly using a JEOL transmission EM (JEOL 1011) with a digitalizing image system (Gatan). Synapses were quantified in the neuropil (i.e., avoiding the neuronal and glial somata and blood vessels). All synapses were counted in each electron micrograph, which represented ∼7.4 μm2 of tissue (total ∼370 μm2 per animal). Units presenting synaptic vesicles in the presynaptic element and presynaptic and postsynaptic membrane specializations visible with or without synaptic cleft evident were counted. Synaptic profiles touching the edge micrographs were not counted. The cross-sectional length of synaptic junctions was measured using ImageJ analysis software (NIH). For postembedding immunogold electron microscopy fixed tissue were washed in phosphate buffer, pH 7.4, dehydrated through a graded ethanol series, embedded in LRWhite resin (Sigma-Aldrich) and polymerized at 50°C, for 24 h. Ultrathin sections were obtained on a RMC ultramicrotome and collected on nickel grids. All sections were blocked with PBS enriched with 1% BSA and 0.5% powdered skim milk for 1 h, and incubated in the following tau antibodies at the indicated dilutions: Alz-50 (1:100), MC1 (1:100), and PHF-1 (1:100), 12 h at room temperature. After being rinsed for 20 min in enriched PBS, the sections were incubated in the secondary antibody goat anti-mouse IgG conjugated to 10 nm gold particles (1:100, BBI Solutions, catalog #EM.GFAF10). Sections were rinsed three times for 10 min each in PBS, and three times for 10 min each in distilled water. As a control for the specificity of immunolabeling, omission of the primary antibody from incubation solutions completely abolished immunostaining for the corresponding antigens (data not shown). The sections were stained with uranyl acetate and lead citrate before examination with a Jeol (JEM 101) transmission electron microscope. Images were taken at 30,000× magnification. Electron microscopy analysis was performed in blinded fashion. Western immunoblot analysis of the macaques brains was performed as described previously (Nirmalan et al., 2009). Samples from superior frontal gyrus of macaques were homogenized in RIPA buffer containing protease and phosphatase inhibitor cocktails and heated at 105°C for 20 min. Extracts were incubated on ice for 5 min, centrifuged at 14,000 × g for 30 min and the supernatant was collected. Protein concentration was determined using the enhanced BCA protein assay kit (Pierce). Samples (40 μg total protein/lane) were resolved on a 4–20% polyacrylamide gel with Tris/glycine/SDS buffer run at 125 V for 80 min at room temperature. For experiments with anti-Tau antibodies, gel was electroblotted onto Odyssey nitrocellulose membrane using 25 mmTris, 192 mm glycine, 20% (v/v) methanol, 0.02% SDS, pH 8.3, at 350 mA for 2 h at 4°C. Membranes were blocked with Odyssey blocking solution in Tris-buffered saline containing Tween 20 (TBS-T; 0.1% Tween 20 in 20 mmTris-HCl, pH 7.5, 0.8% NaCl) for 1 h at room temperature. Primary antibodies (tau-pSer396, 1:100, Tau-5 and anti-β-actin, 1:5000) were diluted in blocking solution/TBS and incubated with the membranes for 2 h at room temperature. After incubation with infrared labeled secondary antibodies goat anti-mouse IRDye 800 or goat anti-rabbit IRDye 800 IgG (H+L; 1:10,000 in blocking buffer, Invitrogen) for 60 min, membranes were washed and scanned in Odyssey Infrared System (Li-Cor Bioscience). Dot blot was performed as described previously (Gong et al., 2003). Frontal cortex from adult rat brain was homogenized in 20 volumes of lysis buffer (PBS, pH 7.4, 0.32 m sucrose, 50 mmHepes, 25 mm MgCl2, 0.5 mm DTT, 200 μg/ml PMSF, 2 μg/ml pepstatin A, 4 μg/ml leupeptin, 30 μg/ml benzamidine hydrochloride), and centrifuged at 1000 × g for 10 min. The pellet was resuspended in 10 volumes of lysis buffer and centrifuged again. The combined supernatants were centrifuged at 100,000 g for 1 h. The pellet was then homogenized in 10 volumes of PBS plus protease inhibitors and was centrifuged at 100,000 × g for 1 h. Protein concentration of the combined supernatants was determined. An aliquot of protein (5 μg) was then concentrated to a volume of 100 μl or less using a Centricon-10 concentrator. Samples (1 μg) were spotted onto a nitrocellulose membrane. Blots were incubated overnight in Tris-buffered saline containing 5% nonfat dry milk, washed with TBST, and incubated with 3% hydrogen peroxide in 20% methanol for 30 min to quench endogenous peroxidase. Unbound material was washed away with TBST and bound Aβ oligomers were labeled with anti-aAβOs (1:250) followed by HRP-conjugated secondary antibody incubation, visualized with Supersignal West Femtochemiluminescent substrate and imaged on photographic film. The TUNEL assay was performed using a Dead-End TUNEL kit (Promega) according to the manufacturer's protocol. Briefly, the tissue was digested for 7 min in proteinase K (20 μg/ml, Thermo Scientific). The reaction was terminated with PBS and the tissue autofluorescence was quenched by incubation with 0.06% potassium permanganate for 10 min at room temperature. Sections were incubated in solution containing the nucleotide mix and the rTdT enzyme for 1 h. Nuclei were stained with DAPI for 5 min. Treatment with DNase I (10 U/ml) was performed for positive control. Slices were mounted with Prolong Gold Antifade and imaged on a Zeiss Axio Observer Z1 microscope. Five to 10 images were acquired for each slice. Apoptotic cells were counted when double-stained for TUNEL and DAPI. Data are represented as averages ± SEM. All statistical analyses were performed with GraphPadPrism. The p values were obtained by a two-tail Student's t test comparing control and AβO-injected groups. Analysis of synaptic numbers was performed with a one-tail Student's t test between groups. A p value of <0.05 was considered significant. Our approach consisted of injecting AβOs into the lateral ventricle of adult cynomolgus brains many years before AD-like features develop naturally in this species, as spontaneous accumulation of Aβ-positive plaques in cynomolgus macaques can only be detected in those older than 20 years (Podlisny et al., 1991; Oikawa et al., 2010). AβOs were freshly prepared before each intracerebroventricular injection and the preparations were routinely characterized by size exclusion chromatography and Western blots (data not shown), revealing a mixture of oligomers ranging from dimers, trimers, and tetramers to larger oligomers (Chromy et al., 2003; De Felice et al., 2007, 2008; Sebollela et al., 2012; Figueiredo et al., 2013; see Materials and Methods for details). AβOs were initially injected in rats (Fig. 1A) and were detected in the frontal cortex by dot blot analysis of cortical homogenates using the oligomer-selective NU4 antibody that does not recognize monomers (Lambert et al., 2007; Fig. 1B). In fact, AβOs diffused into the brain parenchyma and were abundantly detected in the frontal cortex using NU4 (Lambert et al., 2007; n = 13; Fig. 1C–E). As expected, the frontal cortex of control rats that received injections of vehicle did not present any oligomer immunoreactivity (n = 13; Fig. 1E,F). 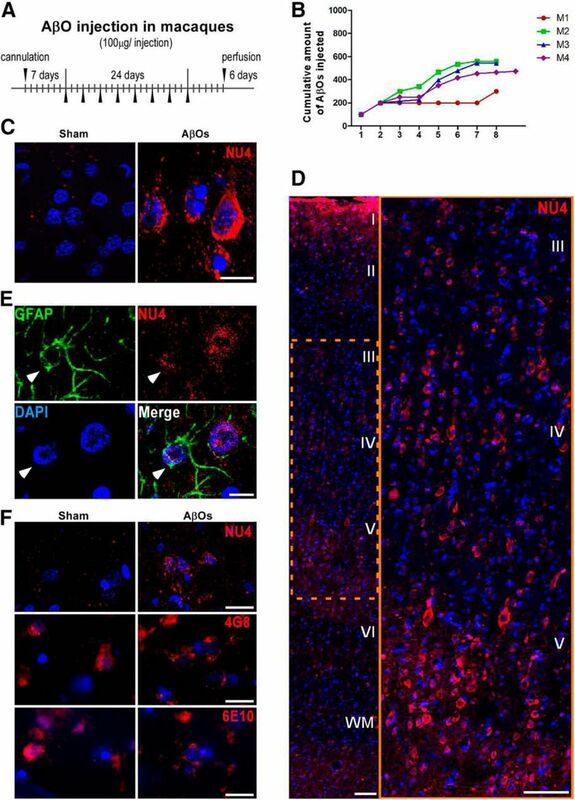 AβOs accumulated frequently in neurons, however, scattered glial cells were also observed presenting NU4 labeling (Fig. 1F,G). 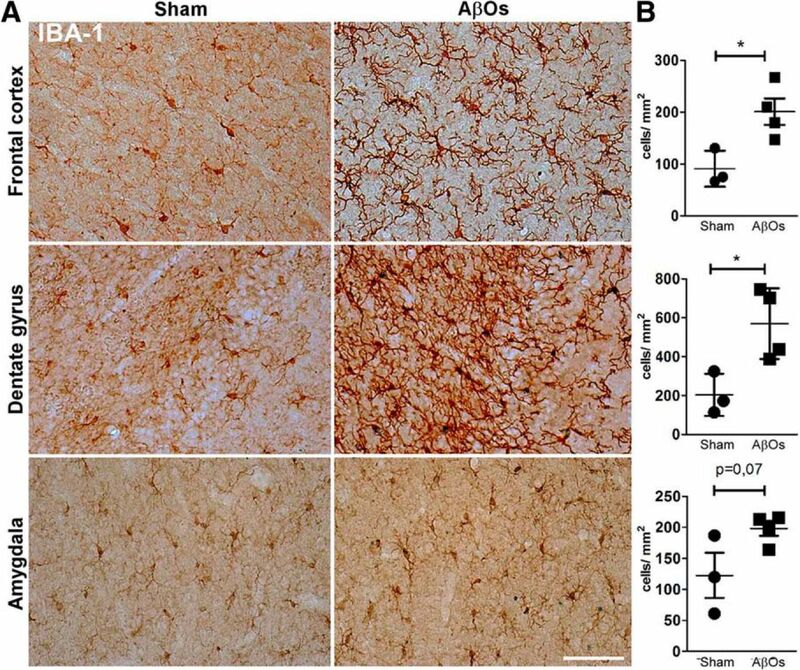 Thioflavin-S-positive fibrillar amyloid deposits were not detected in the brains of rats that received intracerebroventricular oligomer injections for 5 weeks (Fig. 1H), whereas such deposits were abundantly detected by thioflavin-S (Fig. 1I) and by the NU4 antibody (Fig. 1J) in the APPSwe,PS1ΔE9a transgenic mouse model of AD. AβOs diffuse and accumulate in the frontal cortex of rats. A, Chronogram representing the protocol for intracerebroventricular injections of AβOs in rats (n = 15, vehicle; n = 13 AβOs). B, Dot blot of homogenates from the frontal cortex of rats receiving intracerebroventricular injections of vehicle or AβOs (duplicate results from representative rats are shown). (C) Representative image of the frontal cortex of an AβO-injected rat demonstrates abundant NU4-immunoreative cells (n = 13). Scale bar, 250 μm. 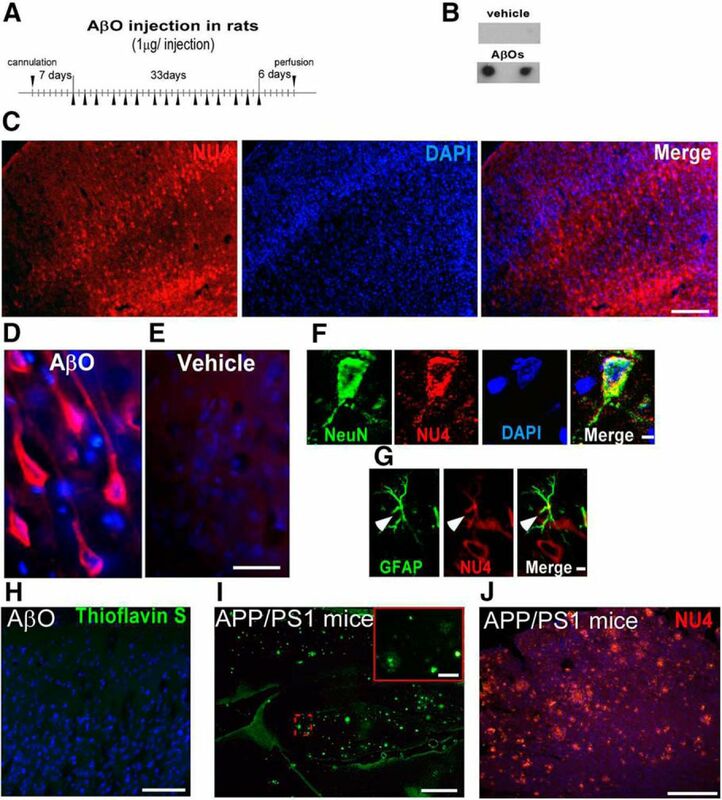 D, E, High-magnification images show that AβOs bind to cells with neuronal morphology, whereas no NU4 staining was observed in vehicle-injected rat brains (n = 13). Scale bar, 25 μm. F, Micrograph of the frontal cortex from a rat that received AβO injections show colocalization between cells stained for NeuN (green) and AβOs (red, NU4 antibody). Scale bar, 5 μm. G, confocal micrograph of the frontal cortex from a rat that received AβO injections show a GFAP-positive cell (green) also presenting NU4 labeling (red). Scale bar, 5 μm. H, I, Representative micrographs of thioflavin-S staining in the hippocampus of a rat injected with AβOs (H), and in the hippocampus of the APP/PS1 mouse. Scale bar, 500 μm; inset, 50 μm; I). Scale bar (in H), 100 μm. J, NU4 labeling in the frontal cortex of the APPSwe,PS1ΔE9 transgenic mouse reveals abundant amyloid plaques (red). Cell nuclei revealed by DAPI staining. Scale bar, 500 μm. We next injected AβOs into the lateral ventricle of four cynomolgus macaques, whereas other three animals served as sham-operated controls (Fig. 2A). The amount of AβOs successfully injected in each macaque was estimated and is plotted in Figure 2B (see Materials and Methods for details). Similar to the results obtained in rats, AβOs were found surrounding neuronal cell bodies and proximal cellular processes in the macaque frontal cortex and other cerebral regions (see below), whereas the controls presented no labeling (Fig. 2C). Comparable to what we observed in rats, AβOs distributed throughout neocortical layers in macaques (Fig. 2D), accumulated in neurons. However, we noted that scattered glial cells presented NU4 labeling (Fig. 2E). As in rats, no fibrillar Aβ deposits were detected in the brains of macaques that received intracerebroventricular AβO injections for 3 weeks (data not shown). We next examined higher-magnification images of the frontal cortex of AβO-injected macaques immunolabeled with NU-4, as well as with the anti-Aβ antibodies 6E10 and 4G8. As shown in Figure 2F, similar patterns of labeling were observed using the anti-oligomer antibody (NU4) and the anti-Aβ antibodies. The three antibodies revealed the presence of surface and intracellular Aβ in cells, while no extracellular aggregates were detected throughout the macaque brains. However, only the anti-oligomer NU4 (an antibody that does not recognize Aβ monomers), as shown in Figure 2F, allowed us to clearly differentiate AβOs labeling in sham-operated controls and AβO-injected macaques. AβOs diffuse and accumulate in the frontal cortex of macaques. A, B, Chronogram representing the administration and amount of injections of AβOs in macaques (n = 3 sham; n = 4 AβOs). C, AβO binding (red) in the frontal cortex of a macaque that received AβO injections. No AβO immunostaining was detected in the frontal cortex of the sham-operated macaques. Scale bar, 25 μm. D, Micrographic reconstruction of a section through the frontal cortex from a macaque that received intracerebroventricular injections of AβOs labeled with NU4 (red). Cell nuclei are labeled by DAPI. Neocortical layers I–VI and white matter (WM) are indicated. Right, High-magnification image of layers III–V, demonstrating the presence of AβO-positive cells (NU4 antibody, red; Lambert et al., 2007). Scale bar, 100 μm. E, Confocal micrograph of the frontal cortex from a macaque that received AβO injections shows colocalization between a cell stained for GFAP (green) and AβOs (red, NU4 antibody). Scale bar, 10 μm. F, Representative micrographs of the frontal cortex of macaques demonstrate the pattern of immunolabeling using and the anti-oligomer antibody NU4 and the anti-Aβ antibodies 4G8 and 6E10. To determine whether there was any regional specificity in brain accumulation of oligomers, we analyzed the distribution of AβO immunoreactivity in 11 different areas in the macaque brain (Fig. 3A; Table 1, top). Results showed that AβOs distributed and accumulated in specific brain areas. AβO-positive neurons were abundantly detected in the entorhinal cortex, hippocampus (dentate gyrus), striatum, and amygdala. The thalamus exhibited some labeling, and markedly fewer AβO-positive neurons were found in the midbrain or cerebellum (Fig. 3B,C). Parallel analysis in AβO-injected rats (Fig. 4A; Table 1, bottom) showed a similar regional heterogeneity in oligomer distribution, although there were some differences in the percentages of detected cells in certain brain areas when compared with macaques (Fig. 4B). Interestingly, the pattern of AβO labeling across the neuraxis in macaques was similar to that described for Aβ in AD patients (Thal et al., 2008). AβOs distribute into distinct brain areas and act as pathogenic ligands in macaques. A, Left, Lateral and sagittal view of the brain of a macaque that received intracerebroventricular injections of AβOs. White dashed lines indicate the regions where slices were obtained to analyze different regions (colored in yellow in coronal slices on the right). Scale bar, 1 cm. B, Representative micrographs images of macaque brains regions immunostained for AβOs. AβOs were labeled using the NU4 anti-oligomer antibody (red, Lambert et al., 2007) and cell nuclei were labeled with DAPI. Scale bar, 20 μm. C, Semiquantitative analysis of AβO-positive cells in different brain regions (n = 3). Error bars are ± SEM. Enth ctx, Enthorinal cortex; DG, dentate gyrus; Amy, amygdala; Occip ctx, occiptal cortex; Thal, thalamus; Ret Nucl, reticular nucleus; Cereb Ctx, cerebellar cortex. AβOs distribution in the rat brain. A, Representative images of brains regions with AβO-positive neurons (red) in rats. Cell nuclei were labeled with DAPI. Scale bar, 20 μm. 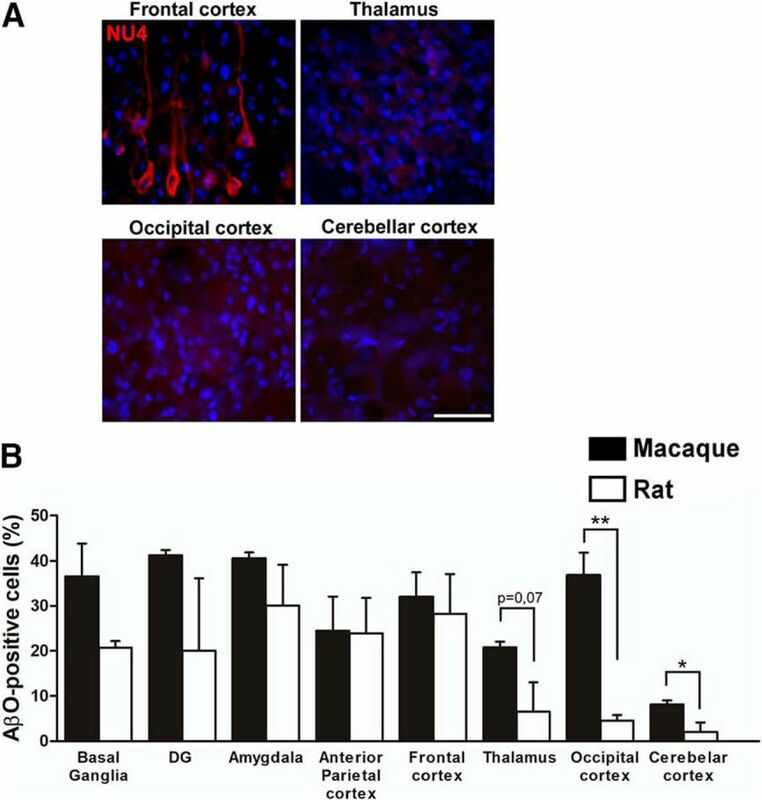 B, Semiquantitative comparative analysis of AβO-positive cells in distinct brain regions analyzed in rats (n = 4) and macaques (n = 4) that received intracerebroventricular injections of AβOs. DG, Dentate gyrus of hippocampus. Bars represent averages ± SEM. Student's t test; *p < 0.05; **p < 0.01. AβOs have been shown to trigger abnormal tau phosphorylation in cultured neurons (De Felice et al., 2008; Jin et al., 2011). We next aimed to determine whether AβOs triggered AD-like tau phosphorylation in the macaque brain. When injected intracerebroventriculary, AβOs induced tau hyperphosphorylation at serine residue 396, an AD-specific epitope (Bramblett et al., 1993), in the frontal cortex, dentate gyrus of hippocampus and amygdala (Fig. 5A), all regions in which AβOs preferentially accumulated (Fig. 3). A similar increase in phospho-tau levels was detected in the frontal cortex of rats that received AβO-injections (Fig. 5B) In contrast, phospho-tau levels were not altered in the midbrain (Fig. 5C), a region that did not accumulate AβOs (Fig. 3). AβOs trigger tau phosphorylation in the rat and macaque brains. A, Representative micrographs showing tau-pSer396 immunofluorescence (green) and DAPI in the frontal cortex, dentate gyrus of the hippocampus and amygdalar complex in a sham-operated macaque and in a macaque that received intracerebroventricular injections of AβOs. Scale bar, 25 μm. Graphs show quantification of tau-pSer396 optical densities using DAB immunostaining (see Material and Methods) of frontal cortex, dentate gyrus, and amygdalar complex. B, Representative micrographs of tau-pSer396 (green) immunofluorescence in the frontal cortex of rats that received intracerebroventricular injection of vehicle or AβOs (n = 4/group). Scale bar, 50 μm. C, Representative micrographs of the midbrain of a sham-operated macaque and a macaque that received AβO injections showing tau-pSer396 immunofluorescence. Scale bar, 50 μm. Quantification of tau-pSer396 densities using DAB immunostaining. Symbols represent the average values for each macaque. All error bars are ± SEM; **p < 0.01, Student's t test. D, Western blot probed with anti-tau pSer396 revealed enhanced tau phosphorylation (∼64 kDa) in all AβO-injected macaques compared with control macaque brains (green arrow); the presence of high molecular mass phospho-tau-reactive bands (>150 kDa) in brain extracts from the frontal cortex of AβO-injected macaques (red arrow). In addition, two low molecular mass phosphorylated tau fragments (<20 kDa) were observed only in brain extracts from AβO-injected macaques (purple arrow). A similar labeling profile between control and AβO-injected macaques was observed when the same membrane was probed with the anti-Tau5 antibody. We next performed phospho-tau immunoblots of brain extracts (Van Hoesen et al., 2000) from all AβO-injected and control macaques. In Figure 5D, Western blots clearly revealed enhanced tau phosphorylation (∼64 kDa) in the four AβO-injected macaques when compared with sham-operated control macaques (green arrow). We further noted the presence of high molecular mass phospho-tau-reactive bands (>180 kDa) in brain extracts from the frontal cortex of AβO-injected macaques (Fig. 5D, red arrow). 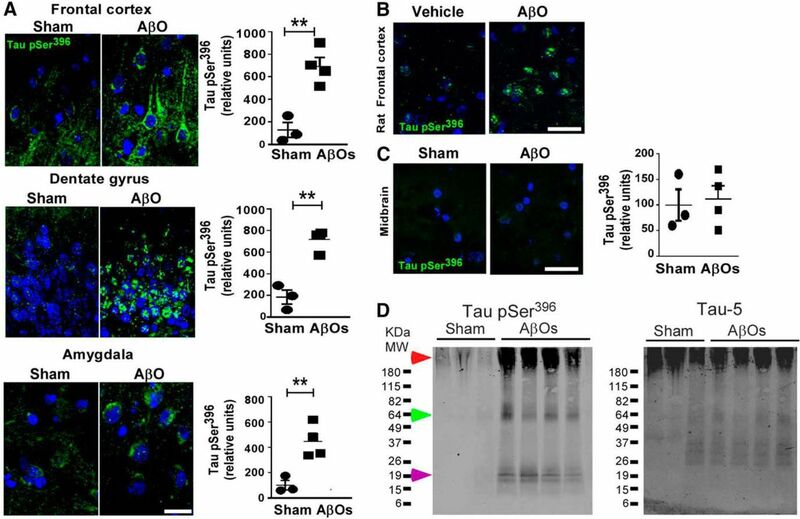 Such aggregates may correspond to tau oligomers, recently reported to be present in Alzheimer's disease brain extracts (Patterson et al., 2011; Lasagna-Reeves et al., 2012; Tai et al., 2012; Perez-Nievas et al., 2013). In addition, two low molecular mass (<20 kDa) phosphorylated tau fragments were observed only in brain extracts from AβO-injected macaques (Fig. 5D, purple arrow). Truncated small tau fragments (10 and 12 kDa) have been early described to be present in neurofibrillary tangles in the brains of Alzheimer's patients (Wischik et al., 1988; Novak et al., 1993; Novák, 1994; Zilka et al., 2006). Although a toxic role of truncated tau fragments has been proposed, this issued remains to be better elucidated. When the same membrane was probed with the anti-Tau5 antibody (which recognizes both phosphorylated and nonphosphorylated isoforms of tau), we observed similar labeling profiles in brain extracts from controls and AβO-injected macaques (Fig. 5D). This result indicates that AβO injections affected phosphorylated tau levels in the macaque brain. We next aimed to evaluate abnormal tau phosphorylation in our model using different tau antibodies. We initially investigated the levels of paired helical filaments (PHFs) reactive to the AT100, which recognizes tau phosphorylated at serine residue 212 and threonine residue 214 (Martinez-Coria et al., 2010), in the frontal cortex, dentate gyrus and amygdala of macaques and increases in AT100 levels in AβO-injected macaques were found in all three regions (Fig. 6A,B). Further tests using the CP13 antibody, which recognizes tau phosphorylated at serine residue 202 (Espinoza et al., 2008), also indicated that intracerebroventricular injections of AβOs led to a significant increase in the number of CP13-positive neurons (Fig. 6C,D). Abundant CP13-positive neurons were further found in the CA1, CA2, CA3, and subiculum (data not shown). AT100- and CP13-positive neurons represent early stage markers of tau pathology, respectively. In conclusion, tau was found to be altered and phosphorylated at multiple residues as a result of the impact of AβOs in the macaque brain. Detection of neurofibrillary tangles markers in the brains of AβO-injected macaques. A, Representative micrographs showing AT100 immunostaining (phospho-tau at Ser212 and Thr214) in the frontal cortex, dentate gyrus and amygdalar complex from one sham-operated macaque and one AβO-injected macaque. Scale bar, 50 μm. B, Quantification of AT100 optical densities using DAB immunostaining in the frontal cortex, dentate gyrus, and amygdalar complex. C, Representative micrographs showing CP13 immunofluorescence in the frontal cortex, dentate gyrus, and amygdalar complex from one sham-operated macaque and one AβO-injected macaque. Scale bar, 50 μm. D, Quantification of CP13 positive cells in the frontal cortex, dentate gyrus, and amygdala. Symbols represent the average values for each macaque (n = 3sham; n = 4 AβO). All error bars are ± SEM; *p < 0.05, **p < 0.01, Student′s t test. OD, Optical density. We performed additional experiments using thioflavin-S staining and specific antibodies to detect the presence of neurofibrillary tangles. Numerous thioflavin-S-positive neurons were found in the neocortex of macaques that received AβO injections, while no staining was detected in the sham-operated macaques (Fig. 7A). The pattern of thioflavin-S labeling throughout the macaque cortex resembled the pattern of tangles described in AD (Van Hoesen et al., 2000; Murray et al., 2011). Extensive analysis of the brains of rats receiving intracerebroventricular injections of AβO failed to detect thioflavin-S-positive tangles (n = 13, data not shown), even though phospho-tau levels were increased in the brains of those rats (Fig. 5B). In addition, Alz50- and PHF-1-positive neurons were only observed in the frontal cortex of macaques that received intracerebroventricular injections of AβOs (Fig. 7B,C). Alz50 is a conformational antibody described to recognize paired helicoidal filament tau (Wolozin et al., 1986) and PHF-1 is described to recognize tau phosphorylation at serine residues 396 and 404 (Greenberg and Davies, 1990). AT8-positive (Merrick et al., 1996) neurons were further observed in the frontal cortex of macaques that received intracerebroventricular injections of AβOs (Fig. 7D). AβOs induce neurofibrillary tangle formation in the brains of macaques. A, Thioflavin-S staining in the frontal cortex of macaques indicates neurofibrillary tangles formation in neurons of the frontal cortex. Scale bar, 100 μm. Optical zoom images of selected thioflavin S-positive neurons in AβO macaque (red dashed rectangles), no thioflavin-S staining was detected in the sham-operated macaques. Scale bar, 5 μm. Representative immunofluorescence of Alz50 (B), PHF-1 (C), and AT8 (D) reveals the presence of tangles in the frontal cortex of an AβO-injected macaque. Immunogold electron microscopy in the frontal cortex of a AβO-injected macaque using conformational antibodies MC-1 (E), Alz50 (F), and PHF-1 for phospho-tau Ser306 and Ser404 (G). Scale bar, 50 nm. The ultrastructure in high-magnification reveals straight tau filaments that resemble neurofibrillary tangles described in transgenic mice (Ramsden et al., 2005; Oddo et al., 2007) and AD brain (Thorpe et al., 2001; Rissman et al., 2004). 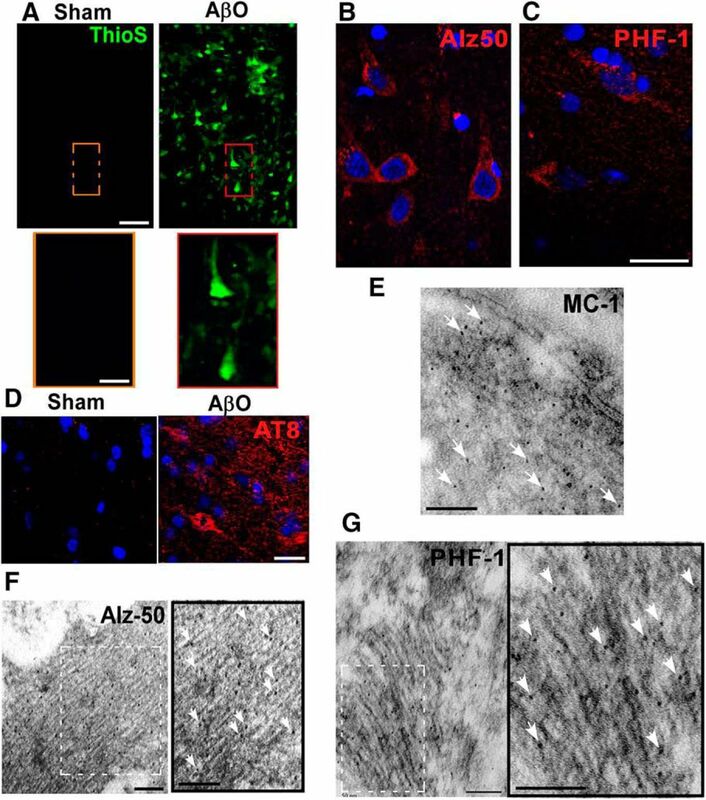 Arrowheads point to MC-1, Alz-50, and PHF-1 labeling. Scale bar, 50 nm. Thio S, Thioflavin S.
Next, we aimed to determine whether neurofibrillary tangles were present in the brains of macaques that received intracerebroventricular injections of AβOs, and to investigate tangle pathology from an ultrastructural perspective. Immunogold electron microscopy was performed using MC-1 reported to detect early conformational changes in tangle formation (Jicha et al., 1997; Rissman et al., 2004), Alz50, and PHF1 antibodies. Antibody-conjugated gold particles were found in association with tangle-like structures within neuronal soma in the frontal cortex of AβO-injected macaques (Fig. 7E–G), whereas no tangle-like structures were observed in control macaques (data not shown). This is in accordance with previous studies reporting that neurofibrillary tangle pathology is very difficult to detect in macaques <30 years of age (Oikawa et al., 2010; Finch and Austad, 2012; Heuer et al., 2012). It is interesting to note that the ultrastructure of tangles we observed is similar to tangle-like structures previously shown in AD brains and in transgenic mice (Rissman et al., 2004; Ramsden et al., 2005; Oddo et al., 2007). Reactive gliosis, including astrocyte and microglial activation detected by increased glial fibrillary acidic protein (GFAP) and microglial levels, are other important features of AD neuropathology (Mattson, 2004; Serrano-Pozo et al., 2011). We recently showed that AβOs trigger astrocyte and microglial activation in the brains of mice (Ledo et al., 2013) and activation of a proinflammation pathway was found to be linked to memory loss and impaired insulin signaling in AD (Bomfim et al., 2012; Lourenco et al., 2013). Therefore, we next aimed to determine whether AβOs induce astrocyte and microglial activation in our model. Sections from the frontal cortex, hippocampus and amygdala of controls or AβO-injected macaques were immunostained for the presence of astrocytes (using anti-GFAP antibody and microglia (using anti-IBA-1 antibody). Compared with sham-operated animals, AβO-injected macaques showed markedly increased immunoreactivity for GFAP (Fig. 8) and IBA-1 (Fig. 9) in the analyzed areas. 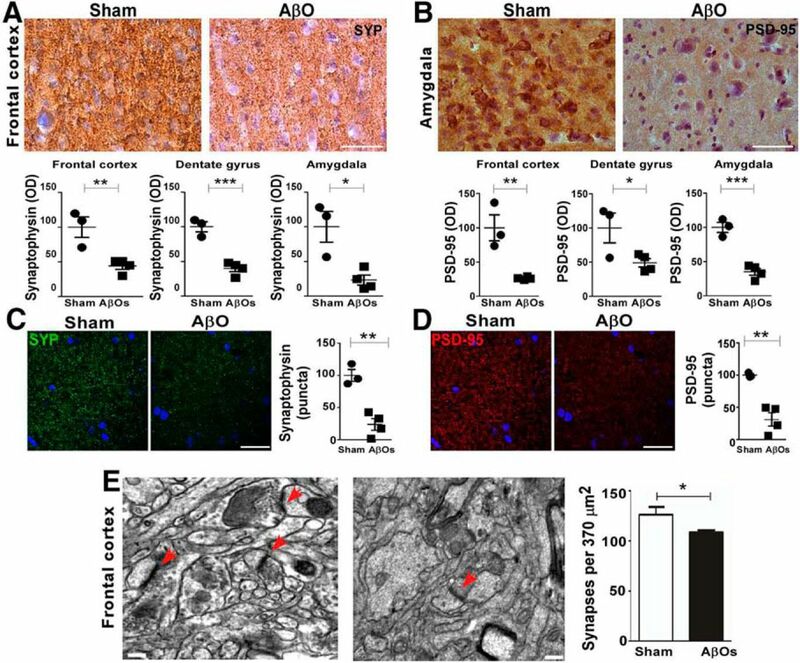 This suggests the presence of astrocyte/microglial-mediated inflammatory processes triggered by AβOs in macaques. Amyloid-β oligomers induce astrocyte activation in the brains of macaques. A, Representative micrographs showing GFAP immunostaining in the frontal cortex, dentate gyrus and amygdalar complex of a sham-operated macaque and an AβO-injected macaque. Scale bar, 50 μm. B, Quantification of GFAP optical densities by DAB immunostaining. Symbols represent the average values for each macaque. All error bars are ±SEM; *p < 0.05, Student's t test. OD, Optical density. AβOs induce microglial activation in the brains of macaques. A, Representative micrographs showing Iba-1 DAB immunostaining in the frontal cortex, dentate gyrus, and amygdalar complex of a sham-operated macaque and an AβO-injected macaque. Scale bar, 50 μm. B, Quantification of Iba-1 positive cells. Symbols represent the average values for each macaque. All error bars are ±SEM; *p < 0.0, Student's t test. IBA-1, Ionized calcium-binding adapter molecule 1. We next investigated TUNEL in our model of AβO-injections, to examine DNA fragmentation in cells undergoing apoptosis. In sections from sham-operated macaques treated with DNase I as a positive control, several TUNEL-positive cells were observed (Fig. 10A). However, in both sham-operated and AβO-injected macaques, very few cells were detected to present TUNEL in the frontal cortex (Fig. 10A,B) and amygdala (Fig. 10C). In the hippocampus, no TUNEL staining was detected in all seven macaques (data not shown). Overall, our results indicate that AβO-injected macaques do not present increase in apoptosis when compared with the sham-operated macaques, at least for the duration they were followed in the present study. AβOs do not induce apoptosis in the brains of macaques. A, Representative images of TUNEL staining in the frontal cortex of macaques; experimental conditions as indicated. DNase I was used as a positive control (see Materials and Methods). Scale bar, 100 μm. Optical zoom images of selected regions are also presented. Scale bar, 50 μm. B, C, Quantification of TUNEL-positive cells in the frontal cortex and amygdala in sham-operated macaques and AβO-injected macaques. Synapse loss is the best pathological correlate of the degree of dementia in AD (Masliah et al., 2001; Scheff et al., 2007). To determine whether synapses were impacted by AβOs in vivo, we examined levels of the presynaptic and postsynaptic markers synaptophysin and postsynaptic density-95 (Cook et al., 2012), respectively. Compared with the sham-operated animals, macaques that received intracerebroventricular injections of AβOs exhibited dramatic reductions in levels of both synaptophysin (Fig. 11A) and PSD-95 (Fig. 11B) in the frontal cortex, hippocampus and amygdala, indicating that oligomers induce damage to both presynaptic and postsynaptic proteins. We further analyzed synaptic puncta number in immunohistology. Results indicate that AβO-injected macaques exhibit decreased numbers of puncta corresponding to presynaptic synaptophysin (Fig. 11C) and postsynaptic PSD-95 (Fig. 11D) immunoreactivities in the frontal cortex. We next performed electron microscopy analysis to assess synapse density ultrastructurally. Synaptic profiles were identified by the presence of the postsynaptic density and presynaptic vesicles. We found that synapse number was decreased by 15% in AβO-injected macaques, compared with controls (Fig. 11E). AβOs trigger synapse loss in macaques. A, Representative micrographs showing synaptophysin immunostaining in frontal cortex and (B) PSD-95 immunostaining in amygdala of the sham-operated macaque and a macaque injected with AβOs. Scale bar, 50 μm. Graphs show quantification of synaptophysin and PSD-95 by optical densities from DAB immunostaining. Representative micrographs of synaptophysin (SYP; C) and PSD-95 (D) immunofluorescence in the frontal cortex of macaques. Graphs represent quantification of synaptophysin and PSD-95 puncta. Symbols represent the average values for each macaque. E, Representative micrographs of electron microscopy. Red arrows indicate regions identified as synapses (presence of postsynaptic density opposed to a presynaptic specialization). Graph represents quantification of the total number of synapses. Graph represents mean ± SEM (n = 3 sham; n = 4 AβO). All error bars are ± SEM; *p < 0.05, **p < 0.01, ***p < 0.001, Student's t test. Here, we demonstrate that intracerebroventricular-injected AβOs diffuse into the brain parenchyma and accumulate in memory-related areas in the nonhuman primate brain, causing tau and synaptic pathology, as well as astrocyte and microglial activation. By injecting AβOs into the ventriculum of adult macaques, we developed a nonhuman primate model that accurately recapitulates central pathological facets of human AD. Human and macaque brains share considerable similarities in terms of overall architecture and functional networks. Thus, generation of a nonhuman primate model to study the effects of AβOs has the potential to greatly advance our understanding of mechanisms centrally implicated in AD pathogenesis and for therapeutic development effective in primate brains. We note that although AβO injections produce pathology similar to AD, the pathology observed has been induced acutely, whereas AD progresses over decades and, therefore, it is not identical to the nonhuman primate model. Nonetheless, such a model of AD may help bridge the gap between promising rodent research and the human disease condition and such model may be useful for testing therapeutic interventions for AD. In AD brains, an imbalance between Aβ production and clearance is thought to cause accumulation of AβOs. As AβOs continue to accumulate in AD brains, larger aggregates tend to form and amyloid deposits start to build up. The spatiotemporal deposition of Aβ in the AD brain has been described as a progressive process (Thal et al., 2008). The neocortex is involved earlier than allocortical regions (e.g., entorhinal region, and hippocampus), which in turn show Aβ deposits before striatum and thalamus. Specific brainstem regions are subsequently involved and finally Aβ deposits are seen in the cerebellum (Thal et al., 2008; Grinberg et al., 2009; Braak et al., 2011). In accordance with the sequential involvement of brain regions in AD, we found that AβOs accumulated in the macaque brain in a region-specific manner, generating an AD-like intermediary stage, with the neocortex, hippocampus, striatum and thalamus being affected by AβOs (Fig. 3). The finding that brain regions associated with cognitive functions highly accumulate AβOs provides a molecular basis for why early AD is primarily a disease of memory. Intriguingly, AβOs did not accumulate in periventricular regions near the injection site in the primate brain. The exact mechanism by which AβOs accumulate in some brain regions, including regions located at a considerable distance from the ventricles, remains unknown. However, it likely depends on the presence of locally differentiated lipid membrane domains that combine particular proteins (and perhaps lipids) that act as AβO receptors. For example, in hippocampal cultures, AβOs bind only a neuronal subpopulation, whereas in cerebellar cultures there is virtually no binding (Gong et al., 2003). In synaptosomes, AβOs bind to cortical but not cerebellar preparations (Lacor et al., 2007). Therefore, it is possible that neurons in areas that preferentially accumulate AβOs in macaque brains present one or more surface proteins forming a receptor complex required for specific oligomer binding (Ferreira and Klein, 2011; Selkoe, 2011). In the human disease, we can speculate that AβOs would initially accumulate in regions enriched with neurons presenting such a specific oligomer receptor complex, with progressive accumulation of AβOs leading to formation of Aβ deposits in those regions. As disease progresses, oligomers diffuse and begin accumulating in additional regions also containing (albeit it in lower proportion) neurons with the appropriate receptor complex. Eventually, at later disease stages, oligomers may reach regions presenting low numbers of neurons expressing the receptor complex, such as the cerebellum. We detected the presence of surface and intracellular Aβ in neurons, while no extracellular aggregates were detected throughout the AβO-injected macaque brains. 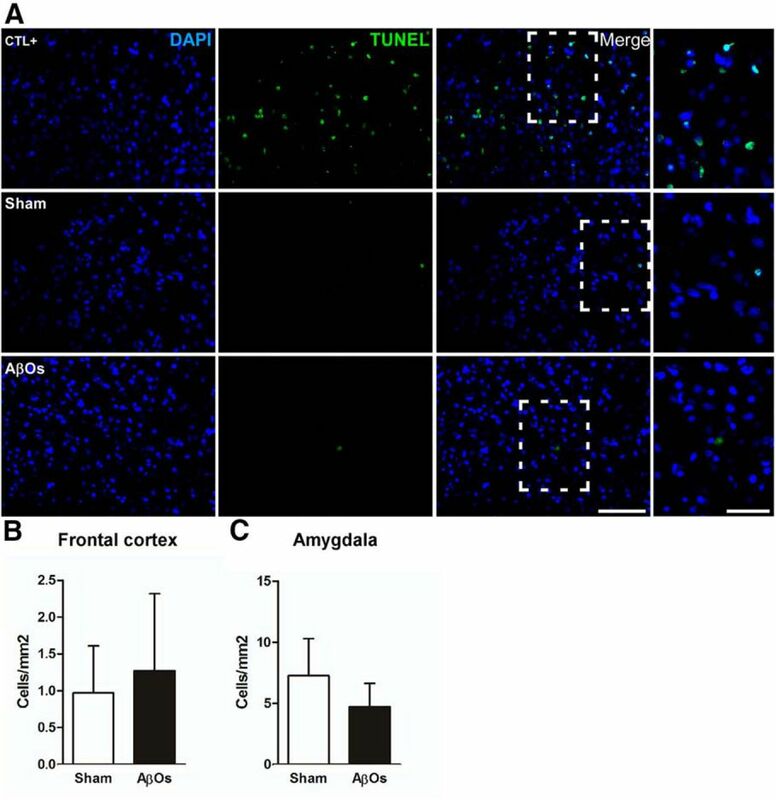 Although Aβ has been classically described to deposit extracellularly, emerging evidence from transgenic mice and human patients indicates that this peptide can also accumulate intraneuronally and this may contribute to disease progression (Gouras et al., 2000; LaFerla et al., 2007) and onset of cognitive dysfunction. It is possible that prolonged injections of AβΟ in macaques would give rise to the formation of amyloid deposits. Nevertheless, the absence of amyloid deposits in our model was crucial to establish that AβOs, independent of the presence of fibrils, trigger tau phosphorylation, tangle formation, and synapse loss in the primate brain. As recently pointed out, development of an animal model of AD that best approximates the human disease has been the goal of several groups and is an important concern in the AD field (Selkoe, 2011; LaFerla and Green, 2012). Major insights into the function of genes associated with AD and associated dementias came from studies using genetically modified animals (LaFerla and Green, 2012). In particular, however, there is an urgent need to develop animal models of AD that better correlates with the much more frequent sporadic forms of AD. In sporadic, late-onset AD, no gene mutations have been identified and the pathogenic trigger has not been explicitly identified but is increasingly believed to comprise soluble AβOs (Hardy and Selkoe, 2002; Shankar et al., 2007; De Felice et al., 2008; Bomfim et al., 2012; Chabrier et al., 2012). A few alternative approaches have used nonhuman primates. Some studies have relied upon naturally occurring Aβ deposits in aged macaques (Podlisny et al., 1991; Oikawa et al., 2010; Toledano et al., 2014). However, due to the long lifespan of primates, such studies may take many years or decades to come to fruition. Other groups have performed intracerebral injections of fibrillar Aβ, causing astroglial activation and neuronal loss closely associated with Aβ deposits (Geula et al., 1998; Leung et al., 2011). As mentioned previously, it is important to note that, except for the baboon (Goedert and Spillantini, 2006), primates seem to be resistant to the development of neurofibrillary tangle pathology unless they are older than 30 years of age (Schultz et al., 2000). It is thus important that we were able to reproduce key aspects of human AD pathology by performing a few intracerebroventricular injections of AβOs (∼100 nmol total Aβ) spaced over a 3 week period. We note that although we have used 9- and 16-year-old macaques, all the analyses performed throughout our work revealed very similar results with animals of different ages within each experimental group. Thus, variable ages used in our work did not seem to have played any noticeable role in the effects of AβOs. Oligomers rapidly induced tau and synaptic pathology at specific brain areas, indicating that this model promptly and efficiently produces specific pathological hallmarks of AD. This underscores the relevance of studying mechanisms germane to AD in macaques, as tangles are not found in rats receiving intracerebroventricular injections of AβOs or generally not present in transgenic rodent models of AD, unless they also carry a specific mutation in tau (Oddo et al., 2003b; Yoshiyama et al., 2007; Filipcik et al., 2012). Therefore, the continued improvement and progress to generate novel animal models are highly anticipated. Development of successful strategies to prevent or treat AD depends critically on detailed knowledge of clinically relevant mechanisms recognized to be central to the disease process. Due to the close similarities between the human and macaque brains in terms of overall architecture and functional networks, the macaque model of AD described here holds considerable potential for allowing detailed molecular mapping of pathology onto functional networks and its correlations with clinical outcomes in a context that would be much more readily translated to the human disease than with currently available rodent models. In fact, a significant impediment to the development of safe and effective therapeutics for several diseases may lie in species differences between humans and animal models used in preclinical studies. Therapies that work in other animals (e.g., rodents) often do not translate to specific human disease conditions. For example, several candidate therapeutic agents have proven effective in rodent models of stroke, but all of them have failed to achieve their primary goal when brought forward to clinical trials (Philip et al., 2009). Indeed, considerable attention in the stroke field is now focused on studies of neuroprotective approaches in a novel macaque model (also using cynomolgus macaques) developed to more closely model the human disease (Fisher, 2009; Cook et al., 2012; Dolgin, 2012).We recently showed that an intracerebroventricular injection of AβOs induces cognitive impairment and depressive-like behavior in mice (Figueiredo et al., 2013; Ledo et al., 2013). It is important to note that our approach does not rely on increased AβOs being the root cause of sporadic AD in humans. We do propose that the presence of AβOs is critical for the disease cascade and, therefore, that understanding and then reversing the effect of intracerebroventricular injection of AβOs in nonhuman primates is likely to lead to development of new AD therapies. We further note that studies aimed at evaluating the impact of AβOs on cognition in nonhuman primates will be important to extend this from a model of AD pathology to a full behavioral model of AD. 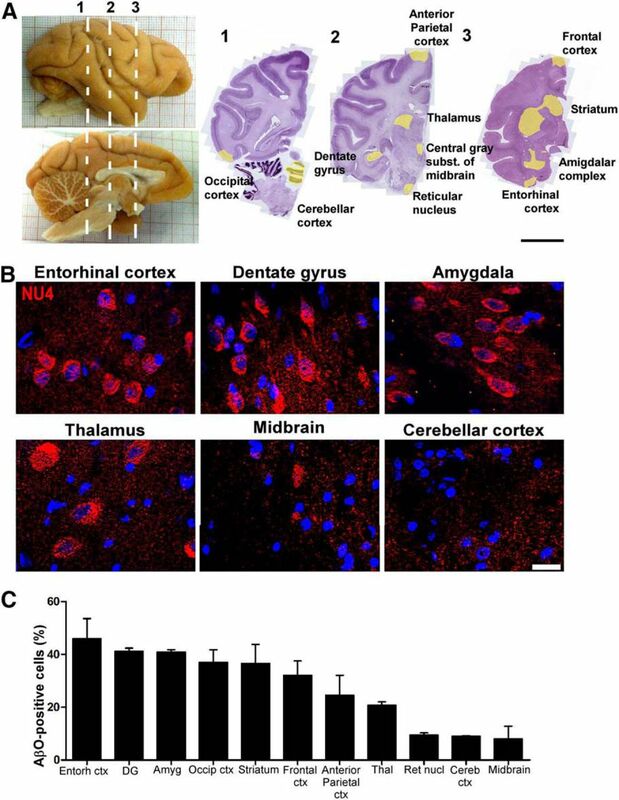 In conclusion, our findings indicate that AβOs diffuse into the brain parenchyma and accumulate in several brain regions, inducing astrocyte and microglial activation, synapse loss, abnormal tau phosphorylation and neurofibrillary tangle formation in some brain regions associated with cognitive functions and operant behavior. Development of a macaque model of AD that recapitulates key aspects of AD pathology by introducing AD-specific neurotoxins may represent a major step forward toward understanding mechanisms of AD pathogenesis and toward developing effective disease-modifying therapies. ↵†D.P.M. and F.G.D.F. are joint senior authors. This work was supported by grants from Human Frontiers Science Program and the John Simon Guggenheim Memorial Foundation (to FGF), National Institute for Translational Neuroscience (Brazil; to S.T.F. and F.G.D.F. ), the Brazilian funding agencies ConselhoNacional de DesenvolvimentoCientífico e Tecnológico (CNPq) and Fundação de Amparo à Pesquisa do Estado do Rio de Janeiro (FAPERJ; to S.T.F. and F.G.D.F. ), Canadian Institutes for Health Research (Grant MOP-38854 to D.P.M. and F.G.D.F.) and Canada Research Chair Program (D.P.M.). NLS and AFB are supported by CNPq predoctoral fellowships. J.B.M. was supported by a CNPq predoctoral fellowship. LFG is supported by a postdoctoral fellowship from FAPERJ/Coordenação de Aperfeiçoamentode Pessoal de Nível Superior. We thank Edil Saturato da Silva Filho, and Dr. Claudia P. Figueiredo (Federal University of Rio de Janeiro, Brazil) for technical advice on macaque brain processing and advice on immunohistochemical analysis, respectively. The following anti-tau antibodies were a generous gift from Dr Peter Davies (Albert Einstein College of Medicine, Bronx, NY): ALZ-50, MC-1, CP13, and PHF-1. W.L.K. is cofounder of Acumen Pharmaceuticals, which has been licensed by Northwestern University to develop ADDL (Aβ oligomer) technology for Alzheimer's therapeutics and diagnostics. (2012) An anti-diabetes agent protects the mouse brain from defective insulin signaling caused by Alzheimer's disease- associated Abeta oligomers. J Clin Invest 122:1339–1353, doi:10.1172/JCI57256, pmid:22476196. (1991) Neuropathological stageing of Alzheimer-related changes. Acta Neuropathol 82:239–259, doi:10.1007/BF00308809, pmid:1759558. (2011) Stages of the pathologic process in Alzheimer disease: age categories from 1 to 100 years. J Neuropathol Exp Neurol 70:960–969, doi:10.1097/NEN.0b013e318232a379, pmid:22002422. (1993) Abnormal tau phosphorylation at Ser396 in Alzheimer's disease recapitulates development and contributes to reduced microtubule binding. Neuron 10:1089–1099, doi:10.1016/0896-6273(93)90057-X, pmid:8318230. (2012) Soluble abeta promotes wild-type tau pathology in vivo. J Neurosci 32:17345–17350, doi:10.1523/JNEUROSCI.0172-12.2012, pmid:23197725. (2003) Self-assembly of Abeta(1–42) into globular neurotoxins. Biochemistry 42:12749–12760, doi:10.1021/bi030029q, pmid:14596589. (2013) A transgenic Alzheimer rat with plaques, tau pathology, behavioral impairment, oligomeric abeta, and frank neuronal loss. J Neurosci 33:6245–6256, doi:10.1523/JNEUROSCI.3672-12.2013, pmid:23575824. (2012) Treatment of stroke with a PSD-95 inhibitor in the gyrencephalic primate brain. Nature 483:213–217, doi:10.1038/nature10841, pmid:22388811. (1988) A grid system and a microsyringe for single cell recording. J Neurosci Methods 26:117–122, doi:10.1016/0165-0270(88)90160-4, pmid:3146006. 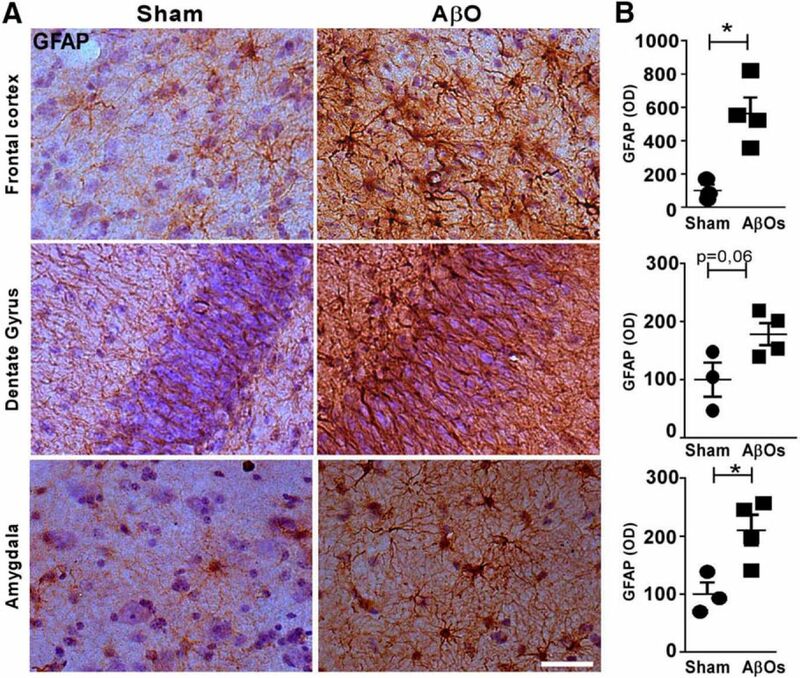 (2011) Brain oligomeric beta-amyloid but not total amyloid plaque burden correlates with neuronal loss and astrocyte inflammatory response in amyloid precursor protein/tau transgenic mice. J Neuropathol Exp Neurol 70:360–376, doi:10.1097/NEN.0b013e318217a118, pmid:21487307. (2007) Aβ oligomers induce neuronal oxidative stress through an N-methyl-d-aspartate receptor-dependent mechanism that is blocked by the Alzheimer drug memantine. J Biol Chem 282:11590–11601, doi:10.1074/jbc.M607483200, pmid:17308309. (2008) Alzheimer's disease-type neuronal tau hyperphosphorylation induced by Aβ oligomers. Neurobiol Aging 29:1334–1347, doi:10.1016/j.neurobiolaging.2007.02.029, pmid:17403556. (2012) To serve and neuroprotect. Nat Med 18:1003–1006, doi:10.1038/nm0712-1003, pmid:22772545. (2008) Differential incorporation of tau isoforms in Alzheimer's disease. J Alzheimers Dis 14:1–16, pmid:18525123. (2011) The Abeta oligomer hypothesis for synapse failure and memory loss in Alzheimer's disease. Neurobiol Learn Mem 96:529–543, doi:10.1016/j.nlm.2011.08.003, pmid:21914486. (2013) Memantine rescues transient cognitive impairment caused by high-molecular-weight aβ oligomers but not the persistent impairment induced by low-molecular-weight oligomers. J Neurosci 33:9626–9634, doi:10.1523/JNEUROSCI.0482-13.2013, pmid:23739959. (2012) First transgenic rat model developing progressive cortical neurofibrillary tangles. Neurobiol Aging 33:1448–1456, doi:10.1016/j.neurobiolaging.2010.10.015, pmid:21196063. (2012) Primate aging in the mammalian scheme: the puzzle of extreme variation in brain aging. Age (Dordr) 34:1075–1091, doi:10.1007/s11357-011-9355-9, pmid:22218781. (2009) Stroke/international stroke conference collaboration. Stroke 40:1947, doi:10.1161/STROKEAHA.109.548131, pmid:19372439. (1998) Aging renders the brain vulnerable to amyloid beta-protein neurotoxicity. Nat Med 4:827–831, doi:10.1038/nm0798-827, pmid:9662375. (2006) A century of Alzheimer's disease. Science 314:777–781, doi:10.1126/science.1132814, pmid:17082447. (2003) Alzheimer's disease-affected brain: presence of oligomeric A beta ligands (ADDLs) suggests a molecular basis for reversible memory loss. Proc Natl Acad Sci U S A 100:10417–10422, doi:10.1073/pnas.1834302100, pmid:12925731. (2000) Intraneuronal Abeta42 accumulation in human brain. Am J Pathol 156:15–20, doi:10.1016/S0002-9440(10)64700-1, pmid:10623648. (1990) A preparation of Alzheimer paired helical filaments that displays distinct tau proteins by polyacrylamide gel electrophoresis. Proc Natl Acad Sci U S A 87:5827–5831, doi:10.1073/pnas.87.15.5827, pmid:2116006. (2009) The dorsal raphe nucleus shows phospho-tau neurofibrillary changes before the transentorhinal region in Alzheimer's disease: a precocious onset? Neuropathol Appl Neurobiol 35:406–416, doi:10.1111/j.1365-2990.2008.00997.x, pmid:19508444. (2012) Nonhuman primate models of Alzheimer-like cerebral proteopathy. Curr Pharm Des 18:1159–1169, doi:10.2174/138161212799315885, pmid:22288403. (1997) Alz-50 and MC-1, a new monoclonal antibody raised to paired helical filaments, recognize conformational epitopes on recombinant tau. J Neurosci Res 48:128–132, doi:10.1002/(SICI)1097-4547(19970415)48:2<128::AID-JNR5>3.0.CO%3B2-E, pmid:9130141. (2013) Cortical networks for ethologically relevant behaviors in primates. Am J Primatol 75:407–414, doi:10.1002/ajp.22065, pmid:22865408. (2007) Aβ oligomer-induced aberrations in synapse composition, shape, and density provide a molecular basis for loss of connectivity in Alzheimer's disease. J Neurosci 27:796–807, doi:10.1523/JNEUROSCI.3501-06.2007, pmid:17251419. (2012) Animal models of Alzheimer disease. Cold Spring Harb Perspect Med 2:a006320, doi:10.1101/cshperspect.a006320, pmid:23002015. (2005) Alzheimer's disease: Aβ, tau and synaptic dysfunction. Trends Mol Med 11:170–176, doi:10.1016/j.molmed.2005.02.009, pmid:15823755. (2007) Intracellular amyloid-beta in Alzheimer's disease. Nat Rev Neurosci 8:499–509, doi:10.1038/nrn2168, pmid:17551515. (1998) Diffusible, nonfibrillar ligands derived from Abeta1–42 are potent central nervous system neurotoxins. Proc Natl Acad Sci U S A 95:6448–6453, doi:10.1073/pnas.95.11.6448, pmid:9600986. (2007) Monoclonal antibodies that target pathological assemblies of Aβ. J Neurochem 100:23–35, doi:10.1111/j.1471-4159.2006.04157.x, pmid:17116235. (2012) Identification of oligomers at early stages of tau aggregation in Alzheimer's disease. FASEB J 26:1946–1959, doi:10.1096/fj.11-199851, pmid:22253473. (2013) Amyloid-beta oligomers link depressive-like behavior and cognitive deficits in mice. Mol Psychiatry 18:1053–1054, doi:10.1038/mp.2012.168, pmid:23183490. (2011) Microglia activation mediates fibrillar amyloid-beta toxicity in the aged primate cortex. Neurobiol Aging 32:387–397, doi:10.1016/j.neurobiolaging.2009.02.025, pmid:19349094. (2013) TNF-alpha mediates PKR-dependent memory impairment and brain IRS-1 inhibition induced by Alzheimer's β-amyloid oligomers in mice and monkeys. Cell Metab 18:831–843, doi:10.1016/j.cmet.2013.11.002, pmid:24315369. (1996) A stereotaxic template atlas of the macaque brain for digital imaging and quantitative neuroanatomy. Neuroimage 4:119–150, doi:10.1006/nimg.1996.0036, pmid:9345504. (2001) Altered expression of synaptic proteins occurs early during progression of Alzheimer's disease. Neurology 56:127–129, doi:10.1212/WNL.56.1.127, pmid:11148253. (2006) A decade of modeling Alzheimer's disease in transgenic mice. Trends Genet 22:281–289, doi:10.1016/j.tig.2006.03.007, pmid:16567017. (1996) Site-specific dephosphorylation of tau protein at Ser202/Thr205 in response to microtubule depolymerization in cultured human neurons involves protein phosphatase 2A. J Biol Chem 271:5589–5594, doi:10.1074/jbc.271.10.5589, pmid:8621419. (2012) Neurotoxicity of amyloid β-protein: synaptic and network dysfunction. Cold Spring Harb Perspect Med 2:a006338, doi:10.1101/cshperspect.a006338, pmid:22762015. (2011) Neuropathologically defined subtypes of Alzheimer's disease with distinct clinical characteristics: a retrospective study. Lancet Neurol 10:785–796, doi:10.1016/S1474-4422(11)70156-9, pmid:21802369. (2011) Cognition and neuropathology in aging: multidimensional perspectives from the rush religious orders study and rush memory and aging project. Curr Alzheimer Res 8:336–340, doi:10.2174/156720511795745302, pmid:21222592. (2009) Development and validation of a novel protein extraction methodology for quantitation of protein expression in formalin-fixed paraffin-embedded tissues using Western blotting. J Pathol 217:497–506, doi:10.1002/path.2504, pmid:19156775. (1994) Truncated tau protein as a new marker for Alzheimer's disease. Acta Virol 38:173–189, pmid:7817900. (1993) Molecular characterization of the minimal protease resistant tau unit of the Alzheimer's disease paired helical filament. EMBO J 12:365–370, pmid:7679073. (2003b) Triple-transgenic model of Alzheimer's disease with plaques and tangles: intracellular Aβ and synaptic dysfunction. Neuron 39:409–421, doi:10.1016/S0896-6273(03)00434-3, pmid:12895417. (2007) Genetically augmenting tau levels does not modulate the onset or progression of Aβ pathology in transgenic mice. J Neurochem 102:1053–1063, doi:10.1111/j.1471-4159.2007.04607.x, pmid:17472708. (2010) Alzheimer-type tau pathology in advanced aged nonhuman primate brains harboring substantial amyloid deposition. Brain Res 1315:137–149, doi:10.1016/j.brainres.2009.12.005, pmid:20004650. (2004) Comparative mapping of higher visual areas in monkeys and humans. Trends Cogn Sci 8:315–324, doi:10.1016/j.tics.2004.05.009, pmid:15242691. (2011) Characterization of prefibrillar Tau oligomers in vitro and in Alzheimer disease. J Biol Chem 286:23063–23076, doi:10.1074/jbc.M111.237974, pmid:21550980. (2013) Dissecting phenotypic traits linked to human resilience to Alzheimer's pathology. Brain 136:2510–2526, doi:10.1093/brain/awt171, pmid:23824488. (2009) Methodological quality of animal studies of neuroprotective agents currently in phase II/III acute ischemic stroke trials. Stroke 40:577–581, doi:10.1161/STROKEAHA.108.524330, pmid:19074479. (1991) Homology of the amyloid beta protein precursor in monkey and human supports a primate model for beta amyloidosis in Alzheimer's disease. Am J Pathol 138:1423–1435, pmid:1905108. (2010) Alzheimer's disease. N Engl J Med 362:329–344, doi:10.1056/NEJMra0909142, pmid:20107219. (2005) Age-dependent neurofibrillary tangle formation, neuron loss, and memory impairment in a mouse model of human tauopathy (P301L) J Neurosci 25:10637–10647, doi:10.1523/JNEUROSCI.3279-05.2005, pmid:16291936. (2004) Caspase-cleavage of tau is an early event in Alzheimer disease tangle pathology. J Clin Invest 114:121–130, doi:10.1172/JCI20640, pmid:15232619. (2007) Synaptic alterations in CA1 in mild Alzheimer disease and mild cognitive impairment. Neurology 68:1501–1508, doi:10.1212/01.wnl.0000260698.46517.8f, pmid:17470753. (2000) Age-related progression of tau pathology in brains of baboons. Neurobiol Aging 21:905–912, doi:10.1016/S0197-4580(00)00176-7, pmid:11124441. (2012) Amyloid-β oligomers induce differential gene expression in adult human brain slices. J Biol Chem 287:7436–7445, doi:10.1074/jbc.M111.298471, pmid:22235132. (2005) From monkeys to humans: what do we now know about brain homologies? Curr Opin Neurobiol 15:135–144, doi:10.1016/j.conb.2005.03.014, pmid:15831394. (2011) Reactive glia not only associates with plaques but also parallels tangles in Alzheimer's disease. Am J Pathol 179:1373–1384, doi:10.1016/j.ajpath.2011.05.047, pmid:21777559. (1998) Mutation in the tau gene in familial multiple system tauopathy with presenile dementia. Proc Natl Acad Sci U S A 95:7737–7741, doi:10.1073/pnas.95.13.7737, pmid:9636220. (2012) The synaptic accumulation of hyperphosphorylated tau oligomers in Alzheimer disease is associated with dysfunction of the ubiquitin-proteasome system. Am J Pathol 181:1426–1435, doi:10.1016/j.ajpath.2012.06.033, pmid:22867711. (2008) Parenchymal and vascular Aβ-deposition and its effects on the degeneration of neurons and cognition in Alzheimer's disease. J Cell Mol Med 12:1848–1862, doi:10.1111/j.1582-4934.2008.00411.x, pmid:18624777. (2001) Utilizing the peptidyl-prolyl cis-trans isomerase pin1 as a probe of its phosphorylated target proteins: examples of binding to nuclear proteins in a human kidney cell line and to tau in Alzheimer's diseased brain. J Histochem Cytochem 49:97–108, doi:10.1177/002215540104900110, pmid:11118482. (2014) Does Alzheimer's disease exist in all primates? Alzheimer pathology in non-human primates and its pathophysiological implications (II) Neurologia 29:42–55, doi:10.1016/j.nrl.2011.05.004, pmid:21871692. (2013) Cartography and connectomes. Neuron 80:775–790, doi:10.1016/j.neuron.2013.10.027, pmid:24183027. (2000) Orbitofrontal cortex pathology in Alzheimer's disease. Cereb Cortex 10:243–251, doi:10.1093/cercor/10.3.243, pmid:10731219. (1988) Isolation of a fragment of tau derived from the core of the paired helical filament of Alzheimer disease. Proc Natl Acad Sci U S A 85:4506–4510, doi:10.1073/pnas.85.12.4506, pmid:3132715. (1986) A neuronal antigen in the brains of Alzheimer patients. Science 232:648–650, doi:10.1126/science.3083509, pmid:3083509. (2007) Synapse loss and microglial activation precede tangles in a P301S tauopathy mouse model. Neuron 53:337–351, doi:10.1016/j.neuron.2007.01.010, pmid:17270732.